Our Public Information Centre offers some 500 films, providing a complete introduction to every aspect of Dianetics and Scientology, including the beliefs and practices of the religion as well as a biographical presentation on the life and legacy of our Founder, L. Ron Hubbard. Our Information Centre further includes exhibits on the many humanitarian initiatives and community outreach programmes our Church sponsors. These include our global network of literacy and learning centres; our worldwide drug education, prevention and rehabilitation programme; our equally far-ranging human rights initiative; and our Scientology Volunteer Minister programme. Visitors to the Centre are welcome to tour the displays at their leisure for as long as they wish and to return as often as they like. Our Chapel is the site of all Scientology congregational services, including Weddings, Naming Ceremonies and Sunday Services open to members of every denomination. 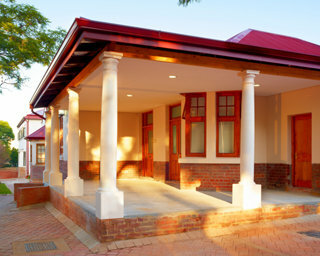 In addition to providing for Scientology gatherings, the Chapel serves as an ideal venue for workshops, banquets and events in the name of community collaboration for the betterment of Pretoria. Our Café welcomes visitors touring the Church and provides a gathering place for those attending our many scheduled events. It is further provided for the convenience of parishioners during breaks in their Scientology services. The bookstore makes available Founder L. Ron Hubbard’s works on Dianetics and Scientology. In all, Mr. Hubbard’s legacy comprises tens of millions of published words in dozens of books and thousands of recorded lectures. A Materials Guide Chart provides an informational overview of every book and lecture series and the subjects contained within each. These materials are available in 50 languages. Our Church provides for the delivery of all Introductory Services. These include courses for the study of Mr. Hubbard’s books and lectures and an entire array of Scientology Life Improvement Courses to help improve any aspect of one’s life. Among the many further Introductory Services available are evening and weekend Dianetics and Scientology seminars, imparting an overview of fundamental principles and their application in life. L. Ron Hubbard developed the Purification Programme to free individuals from the mental and spiritual damage caused by drugs and toxins, through a regimen of exercise, sauna and nutrition—all of which are provided for in our Purification Centre. The mural pays homage to Gauteng’s Witpoortjie Falls. The Hubbard Guidance Centre is where Scientologists receive one-on-one spiritual counselling, known as auditing. The Academy is where Scientologists train to become auditors (spiritual counselors), capable of applying the technology of auditing to help others attain spiritual freedom. Our Pretoria Academy comprises multiple course rooms, each devoted to a different aspect of training. As is traditional in all Churches of Scientology, the Office of L. Ron Hubbard stands in honour of our Founder and symbolises that this Church is true to his writings and ideals. 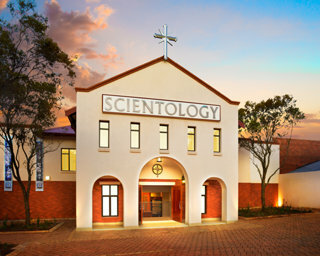 Our Church realises Scientology Founder L. Ron Hubbard’s vision that all Churches of Scientology become what he termed Ideal Organisations (Orgs). Ideal Orgs not only provide the ideal facilities to service Scientologists on their ascent to higher states of spiritual freedom, but they also serve as a home for the entire community and a meeting ground of cooperative effort to uplift people of all denominations. To that end, we share our Church and our many humanitarian and community outreach programmes. Moreover, we look forward to working with every group and individual committed to freedom for all South Africa, in the same spirit of unity with which our Rainbow Nation was forged. Together, we can attain our common dream of a flourishing future for all. The five heritage homes that comprise the Church of Scientology’s campus stand on Stanza Bopape Street in Arcadia, just steps from Embassy Row and the Union Buildings. Built between 1902 and 1908, they pre-date the government centre and represent Arcadia’s emergence as a residential suburb. 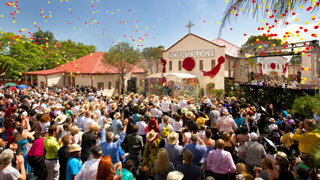 On Saturday, February 23, more than a thousand Scientologists and their guests celebrated as a ribbon fell to herald the opening of the new Church of Scientology Pretoria. National, provincial and city dignitaries and South African royalty joined Church officials for the dedication ceremony.